The Export to PhotoBox plug-in allows you to export photos from Lightroom directly to the PhotoBox Online Photo Service (www.photobox.com). Publish Service - now the plugin gives an option to import existing albums when the user creates a new publish service. This update solves intermittent errors "badServerResponse (12152)" and "networkConnectionLost (12031)" with uploads. This version includes a large number of changes for compatibility with the new API implemented at Photobox recently. Fixed the issue with logging in for customers with international accounts. Fixed: Plugin creates a second copy of the photo on re-publishing. Fixed: Plugin creates a second copy of the photo on export, even when using the "Overwrite duplicates" option. Fixed the "bad argument #1 to 'insert'" error when uploading photos. Publish Service: fixed the issue with publishing the default "Album" album. Fixed the issue with uploading photos containing no keywords. 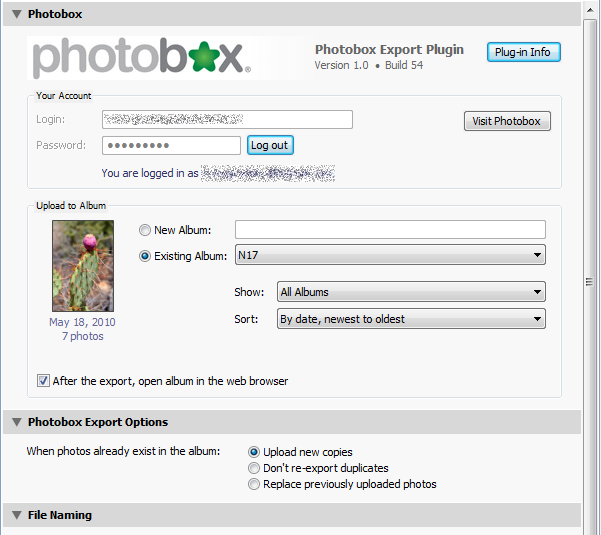 Publish Service: Added the ability to import existing online albums into the PhotoBox publish service. Publish Service: Added the ability to automatically associate online photos with photos in the Lightroom catalog. Publish Service: Added the ability to check for missing photos. Fixed the issue with photo duplicates not being removed when re-exporting previously uploaded photos. Now photo names, descriptions, and keyword tags are populated from photo metadata. Fixed another issue with some uploads to failing intermittently. Windows OS: Implemented a workaround for the intermittent "The handle is in the wrong state for the requested operation" error during large file uploads. Fixed an issue with some uploads to failing intermittently. Export Presets: Fixed the issue with populating the Password field when working with multiple PhotoBox accounts. NOTE: This version will require you to remove the old plugin folder after applying the update. Alternatively, you can exit remove the existing version using Lightroom Plugin Manager, then install the new version using the installation package. Added support for color spaces other than sRGB. Export Dialog: improved album thumbnail's layout. Fixed the timeout error when uploading very large photos. Fixed the issue with duplicating some photos during the upload. Fixed the error "bad argument #1 to 'gsub'" when the album name is blank. Added the ability to retry uploading photos in case of a server communication failure. Implemented automatic recovery when the server connection times out. Added the option to create develop snapshots on Export and Publish. Fixed an error when re-exporting a photo that had already been exported to Photobox. Fixed issues with user authentication at some international sites. Added metadata fields for keeping track of photos that were uploaded via the plug-in. These fields store the upload status, date and time of the latest upload, and the direct URL to access the exported photo at Photobox. You can access these fields in library filters, view them in the metadata browser (as “Photobox Metadata” tagset) and in smart collection filters. New albums created via Publish Services no longer have a blank title. Fixed the "Possible Stack Overflow" error when typing in the username. Fixed the issue with detecting the user's full name. Implemented custom sorting options for photos in published albums. The plug-in is now compatible with Lightroom 3.4RC for Windows and Mac OS. Increased the size of the album thumbnail. Improved the stability of the plug-in when the server connection experiences intermittent issues. Fixed the issue with deleting photos from published collections. Fixed the issue with not listing some of the albums in the account. In some situations this could even prevent the export to a newly created album. Fixed the "Access to an undefined global: PBX" error. Improved stability when the server connection intermittently fails. Fixed the handling of invalid login/password. Added the ability to assign an individual user name and password when you create multiple publish services or multiple export presets for the plug-in. Added the ability to edit album properties from the Export dialog and from Published Collections. Implemented support for international PhotobBox web sites. A quick fix for the the intermittent "unexpected server response" error after uploading a file. The plugin no longer logs out after each export. Fixed the issue with user authentication in some cases. Fixed the issue with creating albums when the name contains XML special characters. Fixed intermittent issues with uploading photos. Added a Preview Album button to open the selected album in the web browser. I’ve tried to download the autoupdate for the photobox plugin but I’m getting a 404 error. Please advise! Please review the Support and Troubleshooting page and submit your debug log. I am sure this is something we should be able to address quickly once we have the necessary information from you. Hi Barry, thanks! The link has been fixed, now it points to version 1.9.2. Is there a way to apply a colour profile, I can't see it? I currently use LR/Transporter to FTP to my PhotoBox & apply sRGB for the FujiFilm Frontier printers & FujiCA_04_07_06 profiles for larger prints on the Polielectronica Laserlab printers. I shoot using AdobeRGB & if the correct profile isn't applied on export then the results are awful, particularly on large images. This must be something they have added recently. Last time I looked they supported only sRGB. I’m going to add the option to choose printer profiles in the next update. Version 1.10.1 now supports additional color profiles. If your profile isn’t in the drop-down list, then click Other… and choose additional printer profile from the list of installed ICC profiles. It is expected because Publish and Export operations are very different. Specifically, when using Publish Services duplicates are always replaced, so there is no need for a UI option. 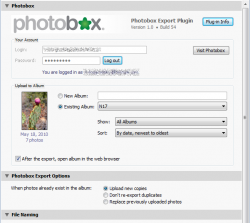 I installed phobox pluin version 1.11.0 on windows 7 as administrator. When I use Lightroom in that account the plugin shows up automatically and I was able to make the connection. However when I log in as a user the plugin does not show up. How do I get the plugin to show up for the users? Thanks for pointing that out. Looks like there’s an issue with running the installer under a non-privileged account. I implemented a fix and uploaded the new installer. I’m getting an “unexpected server response” error when I try to log in to photobox (I know the credentials are correct since they’re working online)… any ideas? Please submit your debug log per instructions outlines on the Support & Troubleshooting page, and I will see what’s causing that.